Seated Liberty silver dollars were minted from 1840 to 1873. You may use this page to look up current Seated Liberty Dollar values in conditions from Good to Proof, as well as pricing trends since 1950 of individual coin dates. Why are pricing trends from long ago to the present day important? Many collectors purchase coins with the hope their selections will increase sharply in future value. Understanding long term pricing trends are the key to accomplishing this objective. No one can predict with 100% certainty which Seated Liberty Dollars are destined to rise to the top of the heap, but the best indicator is to note those dates that have already done so over a long period of time. 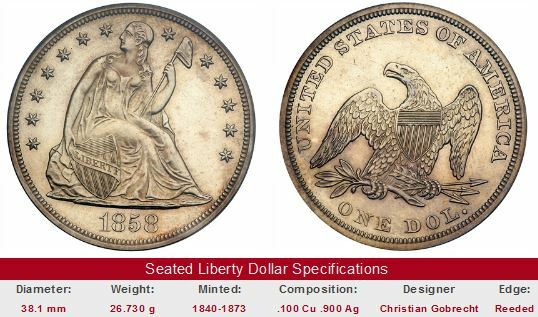 The pricing data contained in the coin value tables posted here (there is one table per date) shed light on the "blue chip" dates of the Seated Liberty Dollar series. We have a section devoted to the origin and history of the Seated Liberty Dollar. Click here to learn more. Also, the 1873-CC is one of the 87 U.S. coins we track in our Rare Coin Values Index. The purpose of the Index is to measure the strength of the U.S. rare coin market. In February 1986, the ANA changed its grading interpretations to match the tightening standards demanded by the marketplace. This meant that many coins correctly graded as MS-65 in the early 1980s became MS-63 or less, so as to be consistent with the newly revised interpretation. Conversely, a coin graded after 1986 as MS-63 was about equal in quality to an MS-65 before 1986. Thus, the Mint State prices published in numismatic periodicals prior to 1986 are not directly comparable to those published later. The Coin Value Tables of this website relied heavily on periodicals from before 1986, but we did not attempt to compensate for the revised grading standards of 1986; we reported what we found. One must take this into account when studying trends for an MS-65 coin from, say, 1980 to the present. On the other hand, because of the dearth of Mint State price estimates published prior to 1986, much of the Coin Value Table data is not affected by anything mentioned in this paragraph! The Coin Value Tables trend data for Seated Liberty Dollars reflect the historic availability of numeric grades. For the 1950-1975 rows, the values in the "G-4" column correspond to the "Good" listing of those years, "VG-8" corresponds to "Very Good", and so on. The "MS-60" column records the "Uncirculated" value reported during those same decades. Starting in the 1980 row, "Uncirculated" grades are broken down into MS-60 and MS-65 designations. Later years indicate an even wider range of "Uncirculated" grades, as data became more available.